Solid wind and blazing sunshine remain the welcome constant factors of this 470 World Championship, run out of Rungsted, Denmark, by the Royal Danish Yacht Club. But today the weather threw up yet more fresh challenge. While the current flowing north out of the Baltic Sea was not a problem, nor yesterday’s awkward offshore breeze, the wind having returned to the south-southeast and gusting up to around 15 knots. But today the wind was oscillating and it was a case of picking the shifts wisely. For the Men’s Gold fleet, this is turning into a high scoring regatta. Having their second disappointing day were this morning’s Dutch leaders, Sven and Kalle Coster. After using up their discard with a 22nd yesterday, today’s 16th and 11th places are counters and have dropped them back to third overall. They are now on 51 points, two behind the consistent Croats Šime Fantela and Igor Marenić, who are tied on points in first place with the Japanese winners of this year’s European championship, and Ryunosuke Harada and Yugo Yoshida. However none of these were on the podium of either of today’s two races. In the first, honours went to Spain’s and Onan Barreiros and and Aaron Sarmiento, last year’s fifth place finishers in Beijing, while the second race went to Austrian duo Matthias Schmid and Florian Reichstaedter’s. 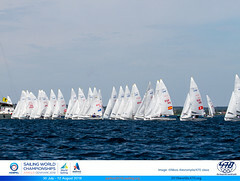 As to the conditions Schmid commented: “I think it was a really nice sailing day - absolutely perfect. The wind was oscillating, so it was not that extreme one side or the other, and for us we always found the good side. Yesterday we were always wrong and today we were always right. You have good days and bad days and today we were not unlucky.” As a result they have elevated themselves from ninth place to fourth overall. Another team whose fortunes turned around dramatically were Greece’s and Panagiotis Mantis and and Kagialis Paulos, who posted a welcome third and a second, in utter contrast to their black flag and 22nd yesterday. “We were lucky in the second race because we didn’t have a good start, but we ended up on the left side,” said Mantis. “We like this breeze and we had good speed and we had a lucky shift to the left and we passed in the front.” “Today the wind was more stable, with less current and more windy. So it was good for us. Tomorrow is another day and probably another wind, another current!” continued Mantis, who has been sailing the 470 since 2000 and who with Paulos are currently the second placed Greek Men’s 470 team in the ISAF rankings, just behind Andreas Kosmatopoulos and Andreas Papadopoulos. 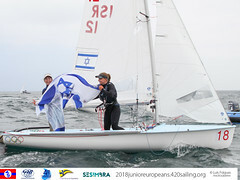 In the Women’s Gold fleet, it is also a high scoring regatta with the exception of one team – the newly co-joined but as individuals hugely experienced Dutch duo of Lisa Westerhof and Lobke Berkhout. Today was the worst day they have had, posting a 3-8, the latter now their discard. 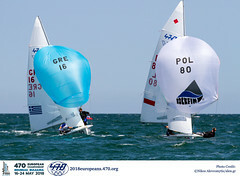 Overall they are on 27 points, 14 ahead of this year’s European champions Guilia Conti and Giovanna Micol from Italy. Today’s race winners were Spain’s Marina Gallego and Julia Rita Roman and Argentina’s Maria Fernando Sesto and Consuelo Monsegur, the latter two of the most seasoned women’s 470 campaigners, having been to the last three Olympic Games. From Minorca, although they are both now based in Majorca, Roman only moved into the 470 last September having previously been a Europe sailor. “So the trapeze for me is new, but it is fun,” she says. Marina Gallego has been in the class for the last four years and the duo are currently the third placed Spanish crew on the ISAF rankings. Yet at this World Championship they are the only women’s team to have scored three bullets. Like the Austrian and Greek men, French veterans Ingrid Petitjean and Nadège Douroux turned their fortunes around today with a 4-2 finish, pulling them up to fourth overall, level on points with Spain’s Tara Pacheco and Berta Betanzos, three points off silver. Conditions, the latest forecast is indicating, could hold until the end of the regatta on Saturday.